Home > What Is Reseller Hosting? 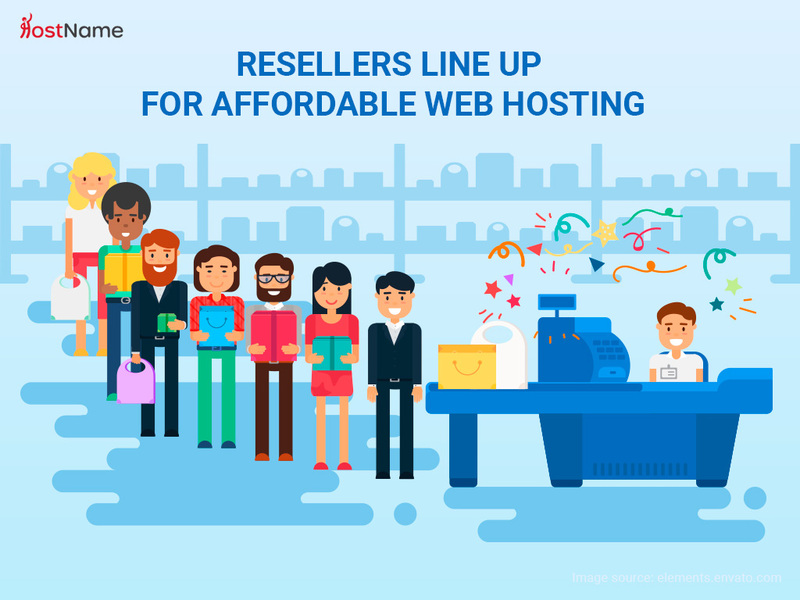 Reseller hosting commonly referred to as white label hosting is a hosting option designed for small to mid-level companies starting out in the market of web hosting. To start your own web hosting company from scratch, you must purchase high end dedicated servers that you can segregate into packages for client usage. You will need to purchase a warehouse or a form of storage to store your servers, this building will require electricity in order for your server to operate. To ensure your servers run efficiently resulting in a reliable service for your clients you need to hire a team who actively monitor your servers for errors. This can cost over $10,000 to setup with no guarantee of sales. If done incorrectly you will end up in debt. White label hosting removes the risk of debt offering a much cheaper option to use for starting your own web hosting company. Simply select a reliable hosting provider and rent a reseller package. Your hosting provider will be responsible for storing and maintaining your server. Good hosting providers will have a team of technicians that monitor their servers ensuring high reliability for you and your clients. How Can I Make Profit With Reseller Hosting? Do your research on hosting providers before selecting the best one. Ask yourself the following questions. Is this host reliable? A reliable hosting provider ensures a smooth uninterrupted service for you and your clients. Does this host offer WHM? WHM (Web Host Manager) is a control panel used to make reseller hosting a simple process. It is highly recommended to use WHM. The most important question is. Can I turn a profit using this provider? When selecting a hosting provider, it is vital to ensure you can generate a profit. How many sales do I need to make before I break even? How many sales can I make once I break even? Answering these questions will give you an estimate of how much profit you can make using this provider. Before purchasing reseller hosting you must select a package best suited to your current business requirements. Ask yourself, How many clients do I need to host? What Packages Am I Offering? Biased on the answer to these questions you can select a hosting option best suited to your current requirements. Your domain name is highly important to the success of your business. Selecting a domain can be a challenging and daunting task. Read our article on selecting a domain to ensure your businesses success. Within Web Host Manager (WHM) you can create hosting packages which you sell to your clients. When creating hosting packages, it is recommended to offer low end to mid-level hosting options. Offering a range of specifications increase the chance of a conversion as clients can select the best hosting package based on their requirements. In order to sell your hosting service to clients you need to first generate traffic and interest to your website. There are three main marketing methods you can take advantage of. Social media is an excellent option to market your website and brand. With social media you can run targeted ads to users already interested in your niche (web hosting). When setting up an advertising campaign you will have the option to select tags. Tags are important as your ads will appear to users who are interested in the tags you select. When selecting tags think, Who is going to click my ad? Targeting your ads to “small business owners” is a good option as many small business currently don’t have a website, when the owner views your advert they may be interested in creating a website for their business using your service. Targeting your ads to “Dog lovers” is a bad idea as people interested in dogs are highly unlikely to purchase hosting from you and will result in wasting money. Ensure you select tags relevant to your advertising campaign to maximise conversions. Using a service such as Google Ads can increase traffic to your website. When advertising via search engines ensure you use tags such as “web hosting”, “hosting provider” or any other related search term. When a user searches a term, you are currently running ads on your advertisement should appear first. To increase conversions, it is recommended to offer 10% off within your advert to tempt users. Selecting appropriate tags reduces the cost of advertising as ads will only appear to your targeted audience (Users interested in Web Hosting). Selecting inappropriate tags will increase advertising costs as your ads will appear to users who are not interested in web hosting. Search engine optimisation (SEO) is a free way to generate traffic however can be very challenging for new users due to the wide range of websites competing for tags. When a user searches for “web hosting” the most optimised websites will appear on the first page. For smaller businesses it is recommended to target uncommon search terms with low competition such as “hosting for my business” as there is less competition for uncommon search terms there is a higher chance of ranking. Can My Clients Tell I’m Using Reseller Hosting? In short NO. This is a major concern for many users looking to start their web hosting companies using reseller hosting. The last thing you need is clients going to your hosting provider for their hosting. White label hosting allows you to remove all presence of your hosting provider allowing you to add your own logos and branding. Upon login your clients will see your logo and brand name within their control panel. Does Reseller Hosting Grow With My Business? As your business grows you will see an increase in clients. Once your first server is full of clients you will be unable to host anyone else until your rent more servers. Using Web Host Manager (WHM) you can easily expand your business by purchasing more servers. This allows you to then host more clients. Once your new server is full rinse and repeat to generate more and more profit.